My local paper Champaign-Urbana News Gazette reviewed my book and that made me really happy! Especially since it was my friend and colleague, Ruth Siburt, who wrote the review: Deb Aronson of Urbana is one fresh voice in the world of middle-grade nonfiction. Her debut book, “Alexandra the Great,” is a 2017 release from Chicago Review Press. “Alexandra” tells the story of filly Rachel Alexandra’s rise through difficult circumstances to world fame. Aronson does an amazing job of combining knowledge of the sport, interviews with experts, and perfect descriptions of action to create a story that even readers with little interest in the sport will love. Readers who have no knowledge of horse racing will learn from the behind-the-scenes details and interviews with the people who worked closest with Rachel Alexandra. Packed with action scenes, Aronson’s biography shows how truly exciting the world of horse racing can be, using the story of the record-breaking filly who beat all the boys. Aronson writes primarily from personal interviews she conducted with the horse’s many owners, trainers, and riders—including jockey Calvin Borel—and includes black-and-white photographs, a glossary of racing terms, an index, and a full bibliography. This is a wonderful book about one of the great stories in American sports. It is one for readers from pre-teens who will love it because it is exciting and easy to read, to adults who will love it because it is exciting and takes them deeply into the realistic world of high-level racing via this rags-to-riches drama….Don’t know much or care much about racing? Doesn’t matter. You will as you read through this book, which you will probably not want to put down or put down only because you might want to savor it….This book did what all good books do; it takes you there and, in this case, rubs your nose in the mud of an off-track or helps you fly down the stretch of a fast surface as if you were the jockey piloting this champion and not just the reader. When I finished this fine book, I indeed felt like I was racing more than reading. Hop on board. 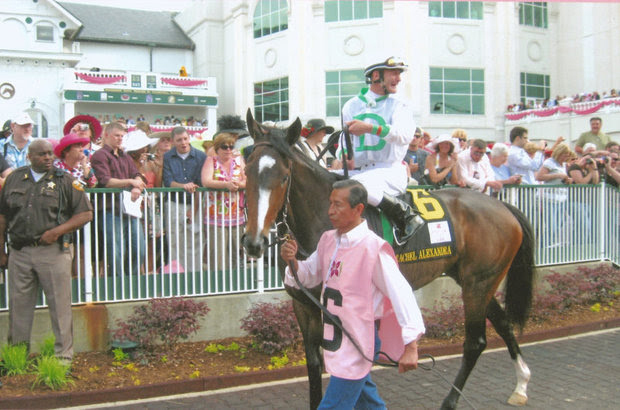 Alexandra the Great is a book that will move readers and will help people understand just how great Rachel Alexandra was. She was all heart, determination and focus, while possessing great athleticism and a tremendous amount of grace. “Secretariat, Seabiscuit, and Man o’ War are some of the most recognizable names in horse racing —and all were winners as colts. This uncommon biography not only focuses on another race horse champion, but a filly that defied odds from the start. Born in 2006 in the Kentucky bluegrass region, the heart of American horse racing, Rachel Alexandra was initially rejected by her mother and suffered an early injury that made many question her racing future. Aronson balances descriptions of the thoroughbred’s unique temperament and long, easy stride with her meticulous training. In the process, the author reveals the fine blend of art and science that goes into developing a winner. The most exciting parts, of course, are Rachel’s record-breaking wins; as the first filly to win the Preakness in 85 years and the first filly to ever win the Woodward, her impressive victories also inspired human feminists across the county. Whether a horse enthusiast or new to the sport, there’s much to learn from Rachel’s story.